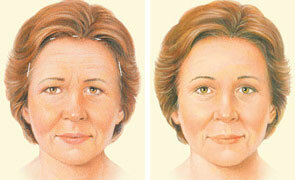 Indications for a forehead lift include visible signs of aging, such as deep forehead creases and drooping eyebrows. The procedure involves removing excess tissue and redraping the skin to smooth the forehead and lift the eyebrows. The forehead lift is typically performed on men and women in their 40s to 60s to slow the signs of aging, but it is also appropriate for younger patients with droopy brows. The surgery takes from one to two hours and is generally performed in an outpatient setting on patients under either general anesthesia or local anesthesia with sedation. After a forehead lift, you may experience temporary headaches as well as swelling and bruising that may last from two to three weeks. Itching is another transient side-effect. Numbness and itching in the forehead and scalp region may be prolonged, and you may have to endure some hair loss for a few weeks to several months. Infection and bleeding are risks, and noticeable and excessive scarring can occur. In some cases, hair loss may be permanent along the scar edges. Nerve injury can cause muscle weakness and loss of forehead or eyebrow movement on one or both sides, either temporary, or rarely, permanent. However, complications are rare and usually minor. After a forehead lift, you can generally go back to work within seven to 10 days and resume strenuous activities within about 4 weeks. Sun exposure (even with sunscreen) should be limited for several months. 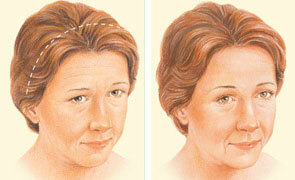 The effects of a forehead lift endure for five to 10 years, sometimes even longer. Medications are administered for your comfort during the surgical procedure. This procedure is usually done under local with IV sedation or general anesthesia. Brow lifts can be performed in different ways. One method is to use an endoscope (a thin tube with a camera on the end) and special instruments placed through small incisions made within the hairline. This allows the tissue and muscle beneath the skin to be adjusted, correcting the source of visible creases and furrows in the forehead. Another method is to perform a browlift through what is called a “coronal incision” The coronal incision is created from ear to ear across the top of the head, within the hair-bearing skin. The forehead skin is then lifted and any muscle adjustment can be made under direct visualization. The resulting scar from a coronal brow lift is well concealed within the hair. During your brow lift recovery, your forehead may be taped and your head may be loosely wrapped to minimize swelling and bruising after the procedure is completed. A thin tube may be present to drain any excess blood or fluid that may collect under the skin. You will be given specific instructions that may include how to care for your incisions, specific concerns to look for at the surgical site and when to follow-up in the office. You should keep your head elevated and perform no vigorous physical activity.